Thank you for stopping by, we are busy as ever, opening new accounts, making product, and sharing Crackheads® with the world. Thank you for your interest and patronage! Happy Holidays! We wish you all the best holiday season and a fantastic New Year! We'll be here for you! Wow, what a busy year. Thank you everyone for your support, we never knew Crackheads would be so helpful to so many. We are up to a lot, but haven't been updating this site as much lately. The end game is Crackheads taste great, and they actually work! Stay tuned for things including a website make over, contest planning, maybe some new products, and more! If you are researching or interested in Jitterbeans Vending Machines, the Company selling them, Renegade Energy Group or Energy-Vend, Inc. no longer has authority to promote, sell, or market vending machines in conjunction with the Crackheads or Jitterbeans trademark or copyrighted material, and likewise is not authorized to sell or promote this product in any manner. Watch the CNBC Crackheads Segment! Crackheads and Jitterbeans now at select Spencer Gifts! Crackheads and Crackheads2 Now Carried in Value Music Stores! We are proud to announce that Crackheads and Crackheads2 is carried in all the Value Music stores located throughout Atlanta, GA! So stop in for a few boxes of Crackheads and grab Jason Lytle's new album. You'll be happy you did. Just In, Crackheads2 shirts for sale! Check them out in the online ordering section. Crackheads available in ALL SPENCER GIFTS end of May! 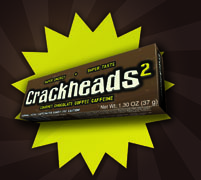 We are proud to announce that Crackheads and Jitterbeans(Crackheads2) will be available in ALL Spencers location at the end of May. Please stop on by and pick up a box! Also, there will be new Crackheads2 shirts for sale soon! Just in, new shipment of Crackheads and Crackheads2 shirts! Woopeee! They will be up soon in the purchase section of the site for your viewing and purchasing pleasure. Also, coming soon, caffeine education, and 10 things to do with your Crackheads segments. Super. Last but not least, we have added about 600 new stores in the recent weeks, so soon enough you will be able to get your Crackheads products close to home! Yay! It is 2009! Go Team. This year to celebrate the price for the Crackheads2® 12-count trays was reduced $31.20 per tray, that is a 20% savings off the retail price! Also, we just moved into a bigger warehouse space with taller ceilings, more docks, and are looking to expand some positions in the near future. There will also be some new Crackheads® / Jitterbeans™ t-shirts and gear coming out soon! We're now in F.Y.E Stores! St. Nick is coming up! If you are looking for a delicious, unique, caffeinated gift this holiday season look no further than your local F.Y.E store! F.Y.E is now carrying Crackheads and Crackheads2 at most of their locations. Stop in and buy a box, your friends are saying thank you already! Jitterbeans Launched! New Osmanium.com Website! 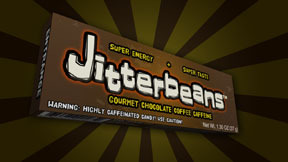 Jitterbeans™ was officially launched October 14th, 2008 along with this new Jitterbeans.com website! We have been getting a great response. People love the taste and the nice caffeine kick! We also have a bulk vending machine opportunity for interested individuals at www.RenegadeEnergyGroup.com Shortly there will be a banner on the site. Everyone is awaiting the new product employment, and it is almost here! Below is a sneak peek of the new product. 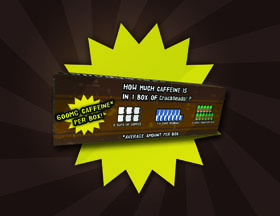 600mg of Caffeine per box! That iss 6 cups of coffee, 7.5 Red Bulls(r) and 11 cans of Mountain Dew(r)! Delicious rich dark chocolate(avg. 60% cocoa), espresso bean center, light candy shell, and Caffeine added. Retail Price per box: $3.25, that is about than $0.50 per cup of coffee! We have receieved a slew of inquiries about purchasing t-shirts and hooded sweatshirts. In the next few days they will be added to site to be purchased. We also have some older shirts that will be clearanced as well. Exhibiting at the All Candy Expo May 20th - 22nd, 2008! We will be exhibiting at illustrious All Candy Expo at McCormick Place in Chicago, IL May 20th - 22nd, 2008. Will post some pics of the booth soon. If you can make it in, it is well worth it!